Our new Mercury 4 Stroke 4hp Short Shaft Outboard weighs about 60lbs and we keep the engine on the boat secured to an Outboard Mount on the Port Side Aft Cockpit Rail. Moving the engine from the Mount to the Dink requires a decent amount of control. 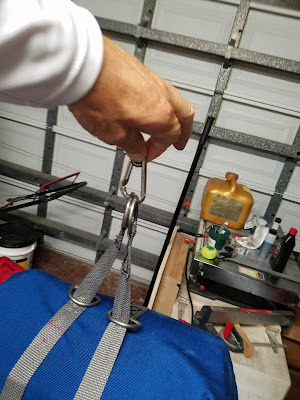 We had purchased an Outboard Engine Lifting Harness for our previous boat and outboard, but I was never happy with it. It always felt as though it was trying to release. So... Time for a DIY solution. The KISS principle is nearly always the best. 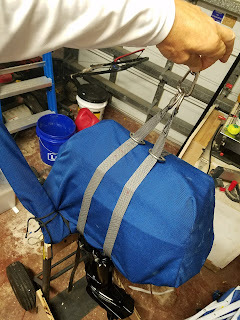 Initially I thought I would need the horizontal strap to prevent the harness slipping off the ends of the engine, but when I did a trial fitting without them, the harness was just right. There are engine parts that stick out from the main body of the engine head that prevent the harness slipping off. The harness fits with the cover on or the cover off. I'll attach the carabiner to the moving block on the hoist tackle.. It took longer to come up with the simple concept than to make it. It feels really secure when lifting the engine. Next is to take the Outboard down to the boat and set it on it's mount. If the persistent gray clouds and soaking rain evenutally decide to move off elsewhere, then we can load the boat and head off for our trip down to the Keys. I'm ready!